Tag, You’re Out—and Back In! Alison Patenaude introduces a game designed to prevent kids from sitting on the sidelines while waiting for the next round. Forget freeze tag. In this variation of the classic game of tag, kids who get tagged have to run a loop and climb a few obstacles to get back into the game. Who wants to stand around during a game anyway? The gym is the river. The gear is the raft. Have your kids set sail for Tire Island—and beyond. 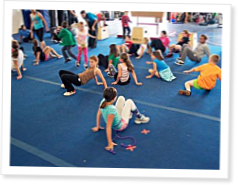 Alison Patenaude shares a simple, fun game that will keep CrossFit Kids moving. Alison Patenaude presents a CrossFit Kids game based on an old favorite. You’ll need to pull out all your gym’s equipment for this kids’ game. Alison Patenaude explains. This game was AMAZING at our martial arts academy. The kids were constantly engaged, and whether they would rather play tag or do the obstacle course, everyone was moving the whole time and having tons of fun. Most common end-game quote: "That was fun! I'm tired."